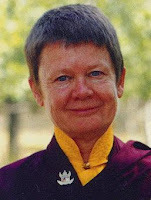 Ah, dear, dear Pema Chodron (or whatever your name was when you were growing up in the Big Apple, where I too did my growing), I adore the freshness, vivacity and revelations of your teachings and the sharing of your own personal struggles. Each of the four books of yours that I have so vividly underlined and underlined and underlined, contain freshets of the friendly truths I have discovered through my teachers and my own meditation,truths I continue to rediscover. I have no doubt that your writings have invigorated my daily meditations. Gratefully, I find myself made more alive by words of yours that have penetrated and nurtured my own psycho-spiritual practices. Not long ago, meditating, after reading you, Pema, there flashed inside me a new answer to why I so often cry at the end of any beautiful, meaningful movie (e.g., Man On Fire, John Q,Tootsie, Now Voyager, Tender Mercies, Secrets and Lies). For years I have thought I cry because of the beauty of those movies,or because my ego jealously thinks I will never accomplish in my own plays and movies work so achingly, and hilariously, and sadly true and touching. Now I know another and deeper reason for my tears. I cry because I have come to love the characters, and when the screen goes dark and they are gone from my life, I miss them. The insights that arise in meditation are sometimes painful, but always a source, in my experience, of future happiness. Years of daily meditation have taught me the unending treasure in my tears, and now I can enjoy them even more, since I know they flow from the broken-heartedness of love.